Much of what surrounds you right now was made in a factory. The vehicle you rode in today, the chair you’re sitting on, the utensils you ate with, and the phone, laptop, or tablet you’re reading this on all started as raw materials and went through multiple processes to become useful to you today. Those processes happen in factories. I have a particular love for factories that make durable goods—products like cars, major household appliances, and major hospital equipment. The kitchen appliance factories I’ve been to in the U.S. start with sheet steel, resin pellets, and paint, and they produce refrigerators, stoves, or washing machines at astonishing rates: as many as half a dozen per minute on a single line, through three shifts a day, five or six days a week, year-round. 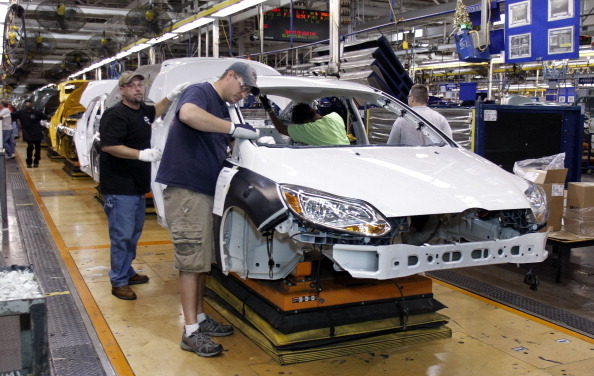 Car factories around the U.S. make millions of cars each year. And certainly there are many factories in China, but, in fact, the United States and the European Union each have manufacturing GDPs that are about as large as China’s. Canada and Mexico also have large and sophisticated manufacturing sectors. Manufacturing happens all over the world and, often, it’s best to make goods as close as possible to their point of consumption—it allows them to be engineered for local needs, reduces inventory and transport costs, and enables the quickest quality improvements. As giant complicated machines that manufacture other large, complicated machines, factories are made up of processes that involve hundreds or thousands of steps, and those steps have to be efficient and consistent. Process steps also undergo continuous modification and improvement—factories are constantly changing, being made more efficient, responding quickly to quality issues, and preparing for the next generation of products. What keeps factories running? People—production workers, line managers, and manufacturing engineers are constantly managing and completing internal factory processes. Building a fully automated solution can take weeks or months and costs huge amounts, and production workers are far more intelligent and flexible than any machine could be (as Tesla Motors learned earlier this year on the Model 3 line). Production workers are usually able to adapt to changes right away with intelligence and dexterity—they can spot developing production challenges and get ahead of them, change a step to insert a quality check, or substitute an improved part for one that’s turned out to be faulty. But heavy parts like car batteries, freezer doors, or electric motors have to be moved around during the manufacturing process, and that’s slow, tiring work for people. Clamps, presses, and much more complex machinery like ultrasonic welders or injection molders may be needed to complete certain steps, and they may be too dangerous for people to be close to. In these cases, manufacturing engineers are forced to use machines to complete steps that could be done better by people, and they end up having to spend large amounts of money and time designing the automation. This kind of excessive automation increases costs and also delays products. Tackling this problem, bringing together the intelligence, flexibility, and dexterity of production workers and the strength and precision of robots and other machines, is what Veo Robotics does. Because machinery lacks the ability to safely co-exist with people in a working environment, robots are caged off and factories can’t reach full potential in terms of flexibility and efficiency. At Veo Robotics we make robots aware of people’s presence and we give them the intelligence to stay out of people’s way. You can think about what we’re doing as analogous to what happened about five thousand years ago, when humans domesticated draft animals and caused a revolution in agriculture. Big draft horses can weigh a ton—as much as big industrial robots!—and have the potential to be extremely dangerous. However, by domesticating them, farmers taught horses to be aware of where people were and to avoid actions that could hurt them. Then farmers could work very closely with horses and produce many more crops to feed many more people. We’re doing that for robots. My first time working with an industrial robot was at the MIT Artificial Intelligence Lab while taking time off from my undergraduate program to be a research staff member. I worked on systems programming for LISP Machines and on various projects with the Robotics Group. While there, I implemented a control system for a Unimation Puma 600, a descendant of the Stanford “Vicarm” (the six-axis arm developed by Victor Scheinman at the Stanford AI Lab) and an early version of the six-axis industrial robots we see in factories all over the world today. The Puma was a beautiful design for its time, completely functional and purposeful. It moved smoothly and precisely and, once interfaced to our LISP Machines, the Puma became a highly useful tool for early research in many of the problems that remain relevant for robots today: the robotics group used it with computer vision systems for bin picking, my officemate Ken Salisbury built and then worked out the kinematics of the first practical robot hand, and David Siegel used it in his work sensing the 3D positions of grasped objects. I loved that robot. But it wasn’t until I was doing my own PhD work, years later, that I began to understand factories as the amazing systems that they are. My own research was in systems: runtime systems, networks for parallel architectures, and operating systems for large-scale parallel computers, and that led me to study stochastic processes and queueing theory, where there were many applications in scheduling work in factories. I was struck by how problems that had been surmounted in processor and network architecture had analogies in manufacturing. I’ll have to wait for a future post to talk more about this, but it’s a fascinating topic. Because of those striking parallels between engineering systems and factory systems, every time I’ve had the opportunity to work on manufacturing, I’ve done so. I love the machinery in factories—as a lifelong gearhead, it just makes me happy to be around machinery—but I’m really excited about the machinery that is the factory: how people drive it, how work moves through it, how it handles variations and faults, and how it can be built to really flow, really perform. The key, as you’ll see, is people and machines working together fluidly, flexibly, comfortably, and efficiently. And that’s what we’re about at Veo Robotics.